Also from the folks at Kaboom! is the comic-book adaptation of Ice Age: Continental Drift, the new Blue Sky Studio film coming this July. The one-shot comic book, meanwhile, comes out in May. “Sid the Sloth, Manny the Mammoth, Diego the Saber-tooth Tiger, and the hilarious saber-toothed squirrel Scrat find themselves on another adventure after their continent is set adrift. Meeting new sea creatures and battling pirates, life is never boring for this wacky herd! Starring the beloved characters from the hit film series!” That’s what they say on their web site. It’s written by Caleb Monroe with full-color art by Shelli Paroline. 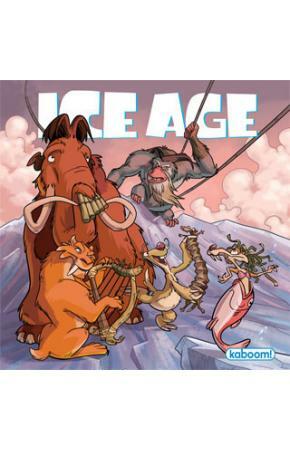 Meanwhile the same team is also producing Ice Age: Playing Favorites, a full-color one-shot original Ice Age story. Both these titles are coming soon.